Why the claims by propaganda sites such as Skeptical Science of "one Hiroshima bomb every four seconds" alleged human impact on climate are lies, and why Trenberth's "missing heat" is not going into the oceans. To put these numbers into a more human context we need a new measure for our energy use. The “Hiro” is one. It is the equivalent to the energy released by detonating one Hiroshima “Little Boy” bomb every second. One Hiro equals 60 trillion watts. 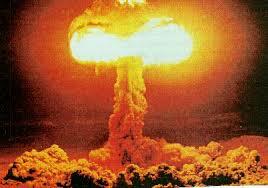 In these terms, our human energy system operates at a rate of 0.25 Hiros, or one Hiroshima bomb every four seconds. That is the equivalent of more than eight million Hiroshima bombs going off each year. This is a disgraceful bit of misanthropy made nonsensical by the fact that the natural energy of the system on Earth is a million times greater than the energy produced by humans and that the energy produced by humans is incremental. We don’t set off atomic bombs when we walk out the door; our energy is expended over time. Such is the insignificance of the energy impact of humans on the Earth’s system that if humanity were to disappear tomorrow all traces of our energy would be gone in a geological blink of an eye. However Sandiford’s insidious metaphor has been picked up by another academic with even less pretension to expertise in the field of AGW. This time the Ivory Tower has let loose one David Holmes, a lecturer in communications, whatever that is. Holmes outdoes Sandiford because now humanity is letting off FOUR Hiroshima atomic bombs every second. Not one but four! As a taxpayer are you getting annoyed yet? Holmes continues by saying all these Hiroshimas, Hiros for short, are going into the oceans which is accumulating heat or energy or Joules or something at the usual rate leading to the destruction of all life on Earth as we know it; in short the usual hysterical alarmism from AGW acolytes. Holmes’ article is the usual garbage tip of scary images and smokestacks billowing out black smoke. If these people were not causing witless governments of all persuasions to waste billions this would be hilarious. But they are causing the wastage of billions so hilarious this is not. To go through each and every one of the canards dribbled out by Holmes the communicator would give unmerited dignity to this dreck and anyway it has all been done before with posts by me and cohenite at this site. On average, little energy is going into the ocean, only two-tenths of a watt per square metre. In a world where the 24/7 average downwelling energy is about half a kilowatt per square metre, that’s tiny, lost in the noise. Nor does it portend much heating “in the pipeline”, whatever that may mean. 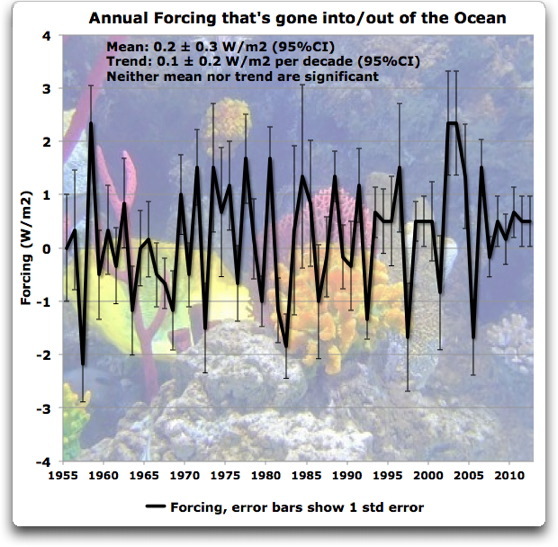 The second is that neither the average forcing, nor the trend in that forcing, are significantly different from zero. It’s somewhat of a surprise. Eschenbach of course will often be surprised since he is a scientist. One feels that academics like Sandiford and Holmes will never be surprised because they are ideologues whose minds are made up. The salient point about this is if the ocean surface is cooling how can heat be moving past the surface and going to the ocean depths? 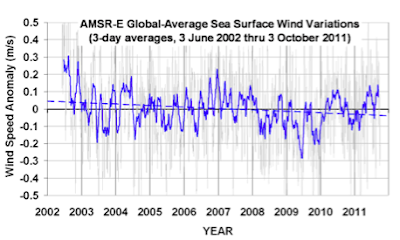 The leading expert [sic] from the AGW coterie of scientists, Trenberth, in his paper on ocean warming says heat misses the surface and moves deeper due to increasing wind variability [see paragraph 1]. Has the wind variability been increasing? So Holmes doesn’t know what he is talking about. He is merely a propagandist. So many academics are like Holmes. They use the imprimatur of their academic position to give weight to their ideological beliefs. Australia has not been well served by its tax-payer funded intelligentsia on the issue of AGW. I'd be interested in your thoughts on this. If one supposed that energy was being stored up on earth at some location, caused of course by the greenhouse effect, we should expect to see a decline in outgoing LWIR, could someone show me where to obtain the data set? Or has someone already integrated up the annual outgoing LWIR. Because really speaking, I expect that the so called missing energy, has simply been emitted back out to space, where it always has. But if the data were collected and graph it might falsify the proposition that heat is being stored here. 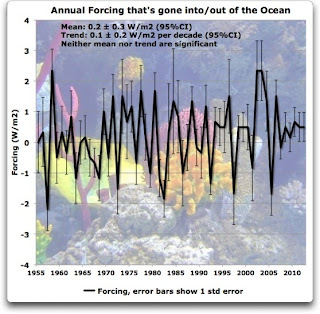 It has been collected and shows that outgoing longwave radiation [OLR] has been increasing, not decreasing, over time and thus the 'greenhouse' effect diminishing with time. You are correct, there is no "missing energy," it was never there to begin with. It is a figment of Trenberth's imagination and his flawed calculations which presume CO2 can add energy to a system from which all energy comes from the Sun. Thanks for the links to a couple of your previous posts. Messrs van Andel and Gray make a lot of sense, even from 2 and 3 years ago. And by the way; I think this is a great blog. You post lots of good information with a strict focus on the science. Keep up the great work. With kind regards from Robin in New Zealand. The Sun puts out 421,000,000 Hiroshima bombs every second on every square metre or a total of 2,566,700,800,000,000,000,000,000,000 Hiroshima bombs every second across the whole surface. Bill, the Sun only puts out about 0.8 Hiroshima bombs every second on every square kilometer of surface (not square meter), or a total of about 10,000,000,000,000 Hiroshima bombs every second across the whole surface. This is a lot, but we need to be reasonably accurate. While the interior is about 27 million degrees K, the surface is only about 5800 K, and radiates as a near black body. We have all of this talk about huge numbers of Hiroshima bombs and about all of the 10^22 Joules the oceans are taking up. But when converting to degrees C, there seems to be almost nothing left as was pointed out in this article. I will illustrate the facts in another way. I will use Figure 5 and assume it is true. According to this diagram, the total heat increase is about 25 x 10^22 J over about 55 years. The total mass of the ocean above 2000 m is 48% of the total mass of the ocean. The total mass of the ocean is 1.37 x 10^21 kg. The specific heat capacity of ocean water is 4000 J/kgK. 25 x 10^22 J/(0.48 x 1.37 x 10^21 kg x 4000 J/kgK) = 0.1 K. Is that correct? If so, it would take over 100 years for the top 2000 m to go up by 0.2 C. Is that supposed to be a problem for us? I doubt it. 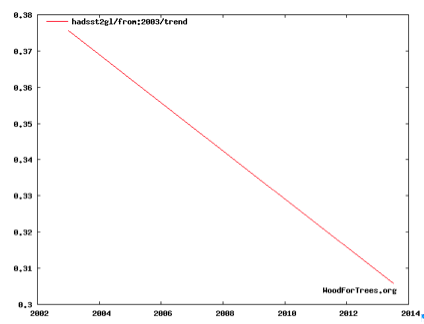 This is the second law of thermodynamics at work – the entropy is increasing. Useful heat is being degraded into a more diffuse, low grade form. It’s like taking a red hot poker and dropping it in a bath of cold water. The heat of the original red hot poker can be used to do some work, but once the heat is transferred to the bath, the temperature becomes that of the bath, whose temperature has risen by only a tiny amount. It is an admission that the problem (if it ever existed), is being solved by nature once and for all. "Eschenbach of course will often be surprised since he is a scientist." "The difference is that Eschenbach readily tells everyone who will listen that he is not a scientist."